Secrets for Lush, Long Eyelashes! Long, lush and healthy eye lashes rank high on a woman's beauty wish list. But not everyone is lucky to have them naturally. Besides beauty, lashes play an important role in maintaining the health of the eyes. As you age, you may feel like your lashes have thinned out. But, it is nothing more than an optical illusion. The fact is, we are born with a set number of follicles and that doesn't change with age. Just like hair, eye lashes naturally fall once they complete their life cycle. Other factors that impact eyelash loss are alopecia, eye lash infection or chemotherapy. 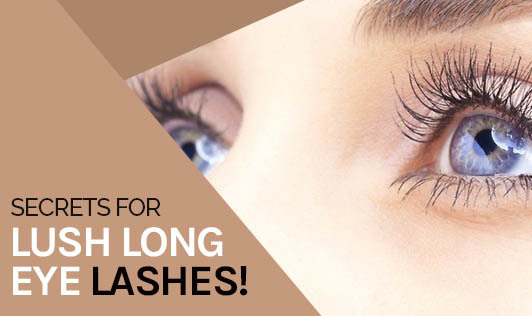 To build better eye lashes, you need to ditch few bad habits and replace them with good ones. • Do not use too many water proof products on your eyes. • Use gentle remover to dab and pat on the lashes rather than pulling or rubbing. • Don't tug at eyelashes. • Do not let your lashes get dry. Condition them with a thin layer of Vaseline at night before you go to bed. • If you do use artificial lashes, then follow these rules. • Do not sleep with fake eyelashes on. Eyelashes are very delicate and can easily break due to our daily habits. Take care of them to enhance the beauty of your eyes.